I was lucky enough to open my first packs of 2013 Topps last night, a sure sign that spring is right around the corner. 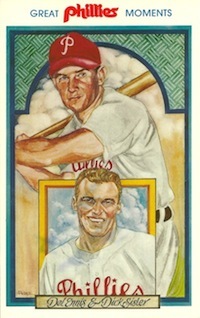 I could really relate to this post over at Uncle Doc's Card Closet celebrating the release of yet another year's Topps cards. Like him, I clearly remember back in the day when suddenly the 1986 Topps packs were gone and packs of 1987 Topps cards were just "there" at Wawa. No Tweets, no Facebook previews - the new cards just magically appeared one day. And I liked it that way. But enough of me sounding like a grumpy old-timer. The 2013 Topps cards are out! 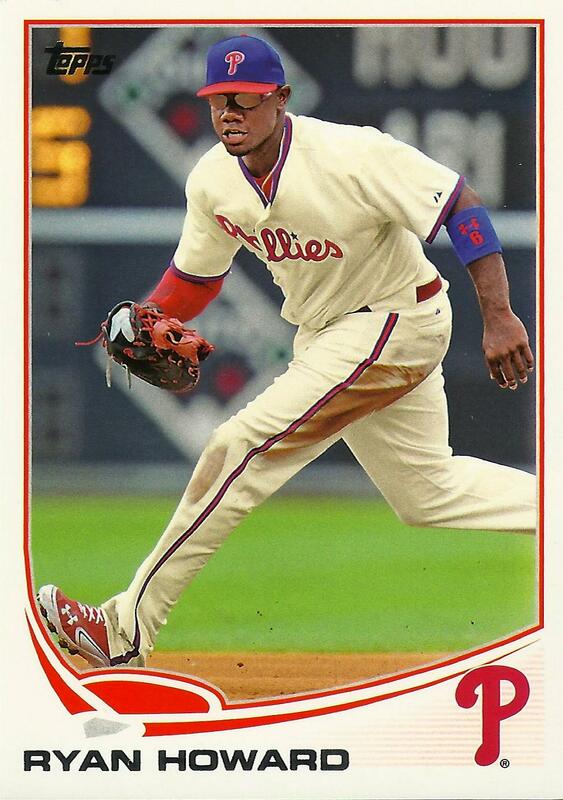 My Target blaster yielded just 2 1/2 Phillies - the Ryan Howard base card featured at the top of this post and two red parallels for Cliff Lee and Michael Young (featuring him with the Rangers). The design of this year's card is very minimalist and my wife Jenna's initial thought was that the cards are reminiscent of something Upper Deck might have put out. My only minor complaint with the design is that for the second year in a row, there's no position listed on the fronts of the cards. Also similar to last year, the backs are very plain. No logo, no second player photo - just a lot of text and numbers. Topps' big marketing campaign this year is centered around "The Chase," which is supposed to entice collectors to chase down various hard to find inserts, autographs and relic cards in packs of their products. They've gone with this theme with a line on the back of each player's cards giving a "Career Chase" update. 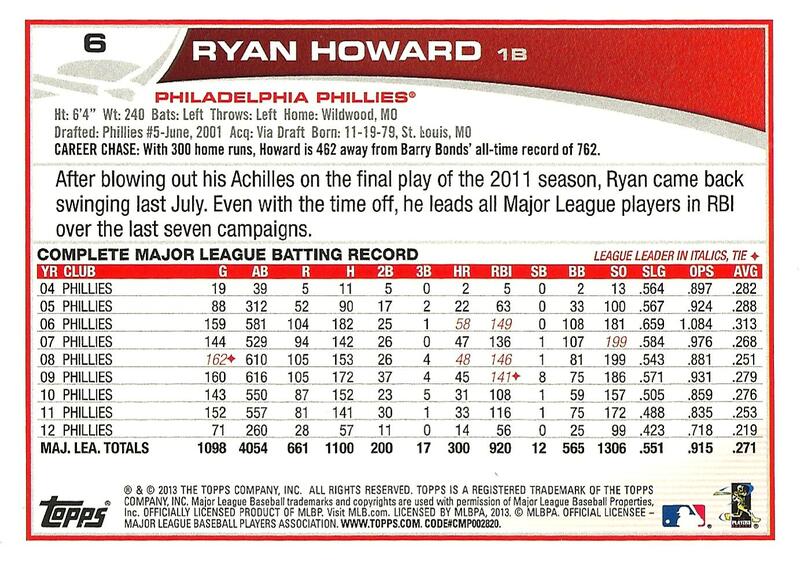 For Howard, the back of his card notes that he's 462 home runs away from Barry Bonds' all-time record of 762. Ambitious, to be sure. So there you have it . 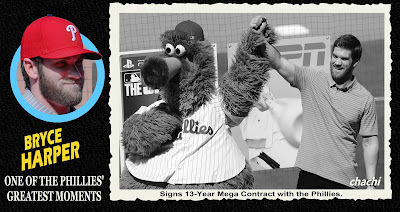 . . Another milestone of the offseason checked off the list and we're one step closer to pitchers and catchers reporting. Alas, in a further sign of his lessening greatness, the use of the word "Chase" these days rarely if ever is an allusion to Chase Utley.